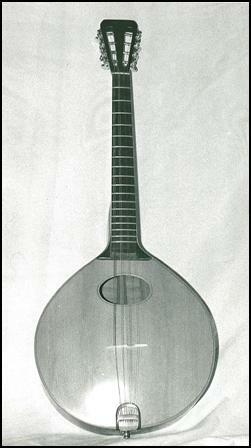 I didn’t plan to become an instrument builder when I made my first cittern in 1973. Several years earlier I’d bought a battered Portuguese Guitarra in a Leeds music shop. I didn’t know how I could play it (and had never heard of Fado music) but it intrigued me. I tuned the six pairs to guitar intervals, but this didn’t work well. Only when Barry Dransfield borrowed it and removed two pairs, tuning the remaining four pairs mandolin style, did it start to make sense. When Andy Irvine came to play solo gigs in Tyneside clubs, he stayed with us in the Black Gate. He was very interested in the Guittarra (and later found one for himself). He dropped the first pair a tone to use as a drone; this was a revelation to me and showed how I could use it for song accompaniment. Around the same time, my wife Liz bought a locally built Appalachian dulcimer. It was nicely made but didn’t play well, so mustering my limited woodworking skills, I made one myself. It worked out well and I built more. 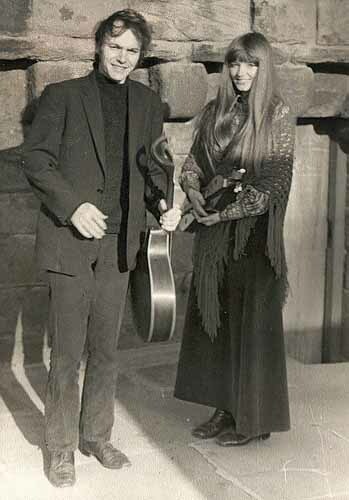 Tuned as Andy had shown me, I played the Guitarra in folk clubs throughout Britain. But its warm, soft tone didn’t carry well in the unamplified venues of the time and I knew it couldn’t be heard well at the back of many clubs. In around 1972 I bought a 1931 arch-top Martin C1 from a visiting American and fell in love with its rich, loud and clangy sound. I’d built several dulcimers by now and decided to try the much more demanding task of building a new Guitarra style instrument with a carved arch-top like the Martin. I also wanted the extra versatility of a longer neck, meaning I’d use a capo to get the Guitarra’s shorter scale. With Liz in around 1970. I’m holding the Portuguese Guittarra, Liz has the dulcimer that inspired me to start building. Shown left is the Black Gate, where Liz and I lived from 1969 to 1975. 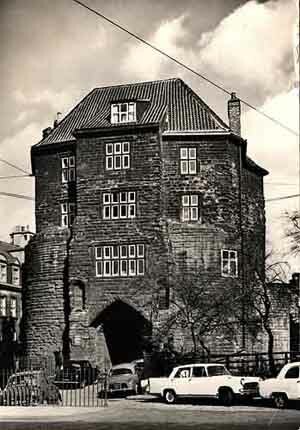 It was the gatehouse to the castle of Newcastle-upon-Tyne. We lived in a flat at the top, almost in the roof, and looked after a library and small museum occupying lower floors. The top room at the front was our son Jason’s bedroom and it was there I built my cittern. Three months and two necks later, my instrument was finished. It had a Yellow Pine soundboard, Indian rosewood back and sides, a mahogany neck, and ebony fingerboard and bridge. I was very happy with it; I loved the sound and it could be heard at the back of crowded rooms in a way the Guitarra never could. It didn’t have a name, but in a book on Renaissance instruments I found a whole chapter on teardrop shaped flat-back instruments, strung with pairs of metal strings, called citterns. The name now usually refers to a five course instrument, but citterns can in fact have any number of pairs of strings. So my instrument became a cittern. 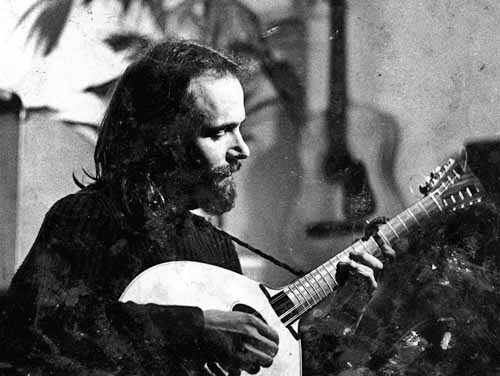 Playing my new cittern in a folk club sometime in the early seventies – clearly a while after the previous picture as I’d grown a beard in the meantime. 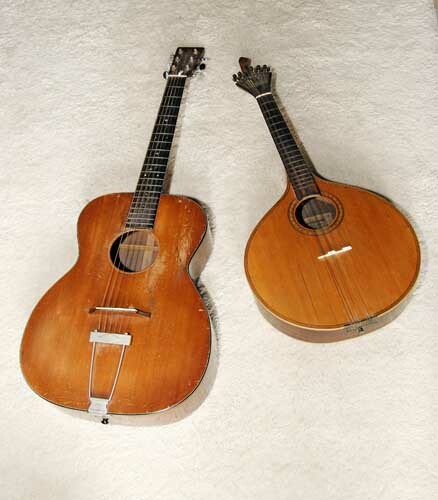 The cittern had the volume and projection the Guittarra lacked, and could be heard much better in unamplified clubs. I took the very heavily cambered fingerboard from the Guitarra, but was happy to replace the fan tuning system with orthodox guitar tuners – the Guitarra had been tricky to tune. The longer scale gave the option of playing in different keys more easily; this was important as the drone tuning meant it really couldn’t be played in many keys without using and moving a capo. 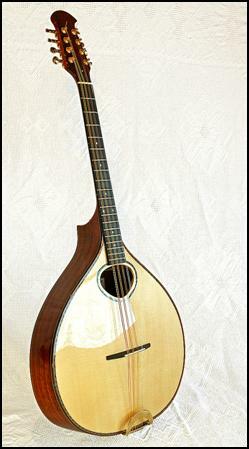 I played this first cittern in clubs all over Britain, and it attracted a lot of interest. A few people even asked me where they could get hold of one, and I told them I could make them one. Considering my limited woodwork skills, and even more limited understanding of how instruments go together and (just as important) stay together, taking commissions for citterns after having built just one was adventurous verging on foolhardy. And heralded a steep and stressful learning curve for several years. But I’d discovered what I would do with my life. I had become an instrument builder.